Dates, details, and contact info for over two dozen Reclaiming camps. Photos and stories from your local Witchcamp - with your help! Email RQ today to help us gather photos and text for all of the Reclaiming Witchcamps. Witchcamps are offered to women and men at all levels of experience. We want these pages to convey some of the magic of Witchcamp. If you've never been to camp, here's a chance to see the beautiful settings and some of the activities. If you have been to camp, here's a chance to reminisce - and to help us cover your camp. Our goal for 2005-2006 is to set up photo-pages for all of the nearly two dozen Reclaiming Witchcamps and Family Camps. Over the years, RQ magazine has featured articles and pictures from many of the camps. We want our website to bring you color photos, reflections, articles, poetry, artwork, and other highlights of all of the camps. These pages will be a place for campers to revisit memories form their own camps and to cyber-visit other camps. Maybe these pages will inspire you to travel to one of these camps in the next year. From the forests of BC and California to the ancient fields and stone buildings of Avalon, from the riverside home of Tejas Web's camp to the snow-labyrinth of Minnesota's winter Witchcamp, RQ wants photos and stories from your camp. Here are the first few camps - chosen because they sent us photos! To add to these pages, or to help us create pages for your camp, email RQ. Photos and stories from your local Witchcamp - with your help! Email RQ today to help us gather photos and text for your camp. 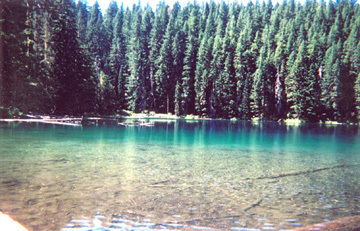 Photo of Free Witchcamp, Oregon ©2005 by Pam BasiliusPlease do not copy, reproduce, fold, spindle, mutilate, or otherwise use them without written permission. Thanks!